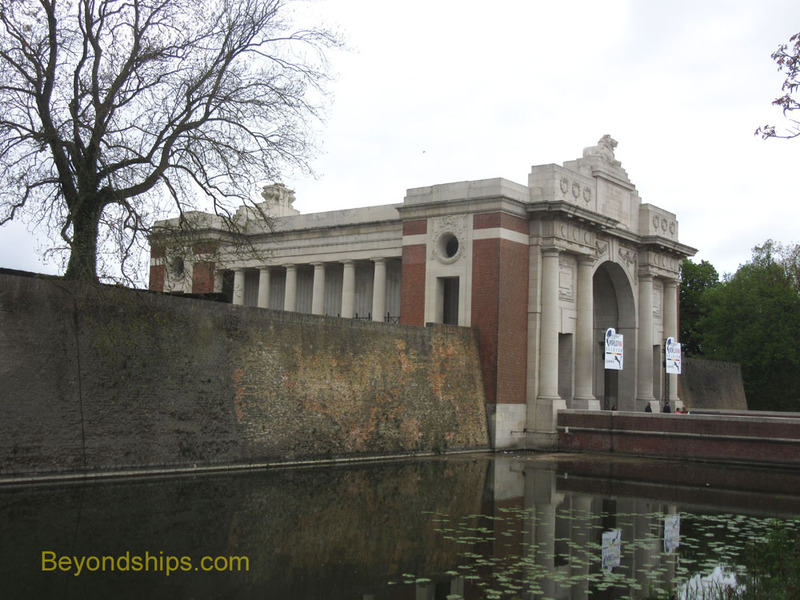 Traveling into the city, our next stop was the Menin Gate. In medieval times, Ypres was a walled city. Its defenses were strengthened in the 17th and 18th centuries so that the city became surrounded by ramparts. The city has now grown past these defenses and so the ramparts have now become a green belt around central Ypres. In order for people to get in and out of a fortified city, there have to be gates. The gate on the road to the town of Menin was the gate closest to the front line. Thus, although this conclusion is disputed, the Menin Gate was the gate that most of the Commonwealth soldiers went through on their way to the front. After the war, it was decided to erect a memorial to the Commonwealth soldiers killed in the Ypres Salient. Architect Reginald Blomfield was selected to design the memorial. Poet Rudyard Kipling wrote some of the inscriptions on the memorial. The memorial is a massive structure. 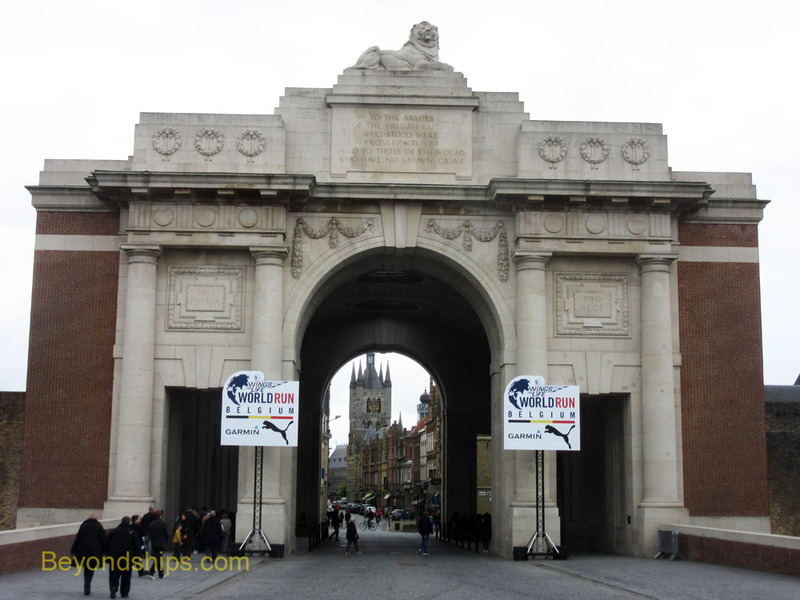 A tall archway allows the Menin Road to pass through. Atop the memorial is a statue of a defiant lion, which represents both the British lion and the lion of Flanders. Within the archway and between the columns on either side of the building are the names of 54,986 Commonwealth soldiers killed during the battle whose remains have never been identified. It is not a complete list. As mentioned earlier, there was not enough room for all the names. In addition, New Zealand and Newfoundland elected to list their missing in separate memorials. The Menin Gate has been controversial since it was built and highlights a dilemma often associated with war memorials. A monumental structure like the one designed by Blomfield is reminiscent of a Roman triumphal arch. It can thus be said to glorify war and distract attention from the horror in which the soldiers died. At the same time, the sacrifice that these people made should be honored and remembered because as long as people start wars, others must defend. Furthermore, memorials have to be somewhat sanitized because the reality is just too horrible for the public to accept. Each evening, the local fire brigade stops traffic on the Menin road and a bugler plays the “Last Post.” This ceremony has been performed every night since 1928 with the exception of the years of German occupation during World War II. 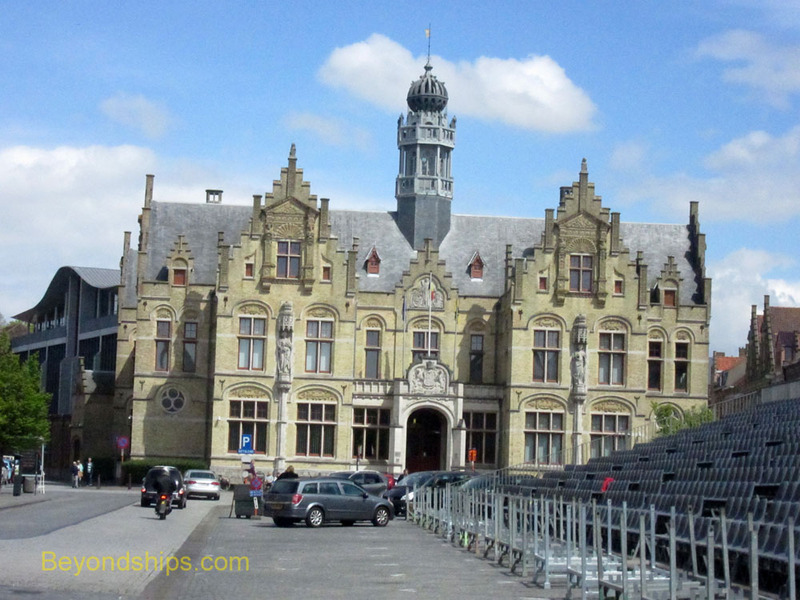 Going into central Ypres, the city takes on the look of a medieval or Renaissance town. However, this appearance is deceiving. Ypres was reduced to rubble during World War I. Winston Churchill reportedly thought that Ypres should be left that way so as to remind the world what war was really like. However, the citizens of Ypres decided instead to rebuild the town the way it was before the destruction. Consequently, buildings such as the town hall and the cathedral are recreations of the town's ancient buildings. Our next stop was the In Flanders Fields Museum. This is located in the Cloth Hall off the town's main market square. In the Middle Ages, Ypres was an important center for the production of cloth. Therefore, a huge commercial building was completed in 1304 to serve as a market and warehouse,. The Cloth Hall was severely damaged by shellfire during the First World War leaving only a portion of the tower and some walls. It took more than 40 years to reconstruct. The In Flanders Field Museum tells the story of World War I in Flanders. It askews the traditional rows of display cases filled with artifacts in favor of multimedia exhibits. Much use has been made of personal stories and diaries to present the war on a human scale. These include accounts from both sides. Thus, the museum is not about triumphant generals, statesmen, dates and strategy. It does touch upon those things but the primary thrust is a personal one. As has become more and more common at European museums, you tour the exhibits with an audio device rather than with a guide. This leaves you free to see what you want and to hear as much about an exhibit as you desire. 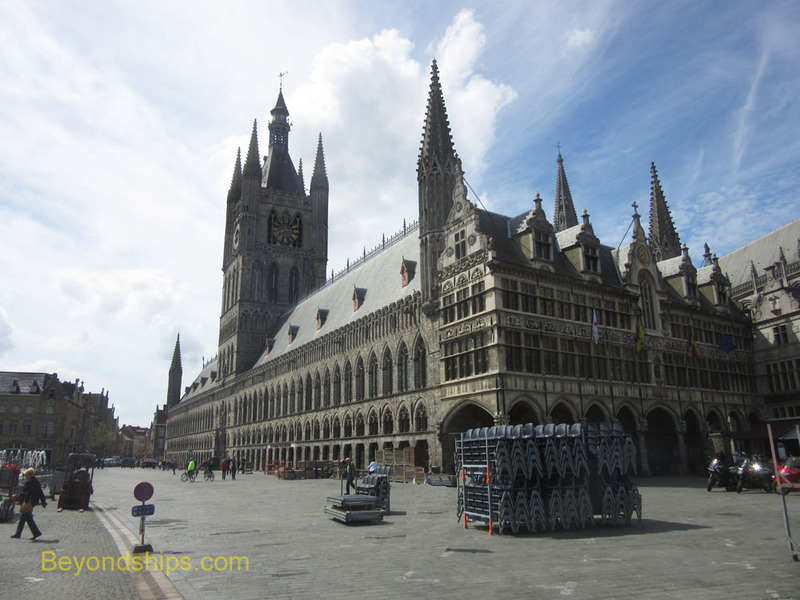 If you have time left after visiting the In Flanders Fields Museum, nearby is Saint Martin's Cathedral. 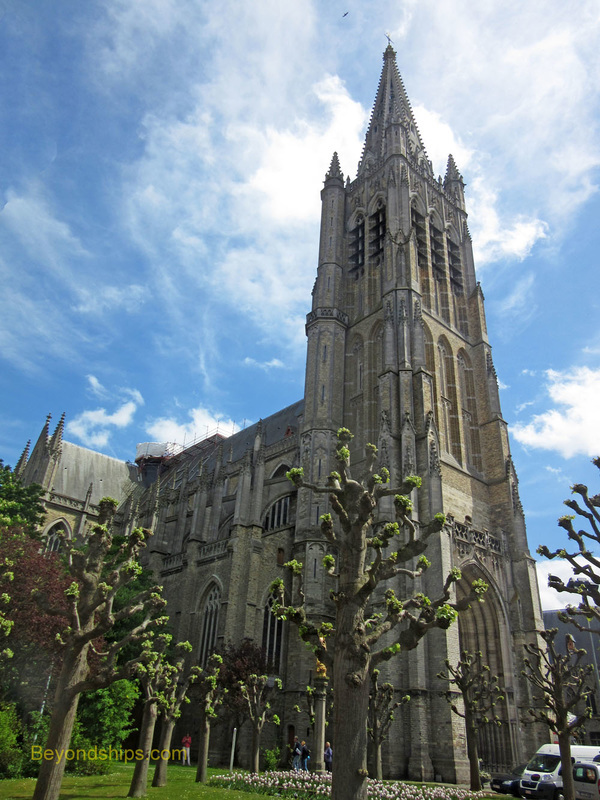 Originally begun in 1210, the cathedral was heavily damaged during World War I. It was reconstructed in the Gothic style. The tower is some 100 meters high. While the main part of the church is open to the public, the tower is not. Across and further down the street is St. George's Memorial Church. 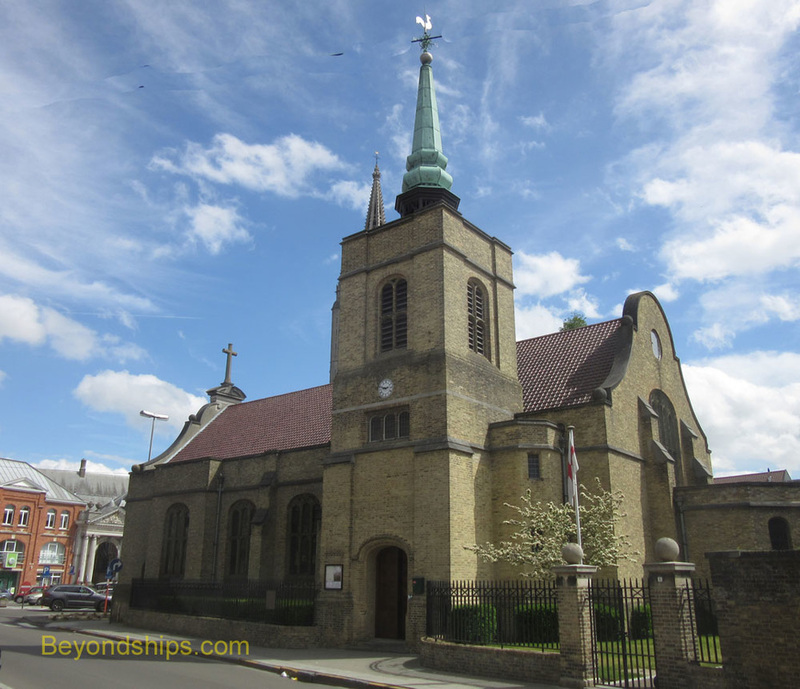 This Anglican church was built as a memorial to British troops who died in the battles in the Ypres Salient. The same architect who designed the Menin Gate memorial designed this church. 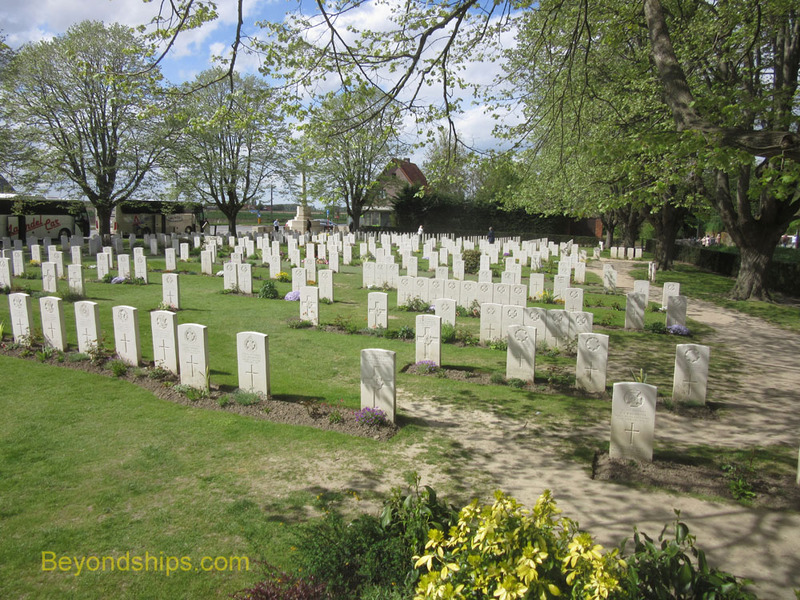 The final stop on this tour was Essex Farm (also called the Canal Embankment John McRae Site), which is north of central Ypres. At Essex Farm, you can still see some of the bunkers used by medical personnel to treat the wounded. These nightmarish concrete facilities are in stark contrast to the green trees and the grassy peaceful embankment. Not everyone could be saved and so next to the medical station is a small cemetery. It is said that Colonel McRae noticed how poppies grew among the grave markers while conducting a burial service for a friend killed in the battle. This inspired him to write his famous poem. In sum, this is a tour for those interested in history as well as those seeking to comprehend the unthinkable. The guide provided good commentary while we were traveling from one stop to the next. However, at the stops you were pretty much free to see what you wanted. 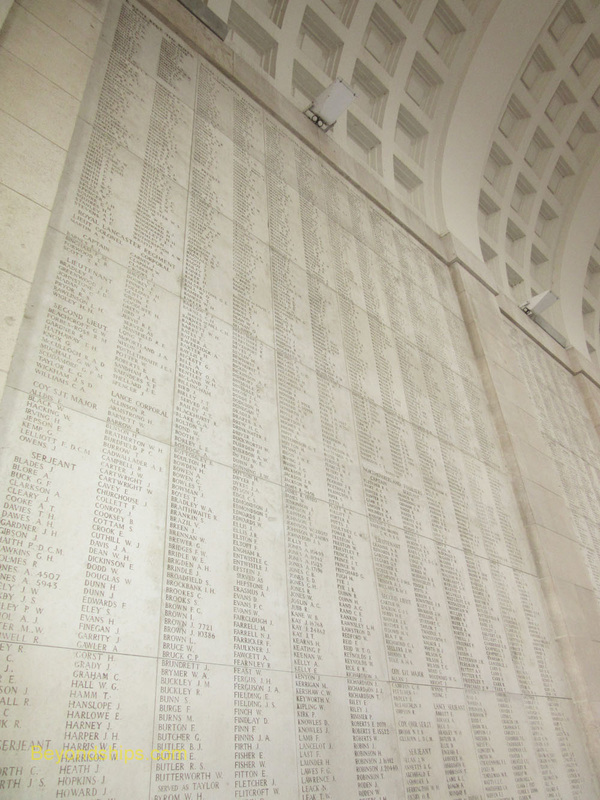 Below: Both inside and on the exterior of memorial are the names of Commonwealth soldiers with no known graves. Above: The Cloth Hall houses the In Flanders Field Museum. It is also the center for Ypres' bizarre Cat Festival. In the Middle Ages, a population of mice and rats took to living in the cloth stored in the hall. Cats were introduced to eradicate the rodents. However, the hall soon became overrun with cats. To eliminate this new pest, someone began tossing cats out the windows of the hall's tall tower. This rather barbaric practice became ritualized and the basis for a festival. The last live cat tossed off the tower was in 1817. Today, the Cat Festival continues with a jester throwing toy cats off the tower. Below: The Town Hall at the opposite end of the market square. Below: St. George's Memorial Church. Above: The Advanced Dressing Station at Essex Farm. Below: The cemetery at Essex Farm.